Although I’m well aware of this event from 1919 thanks to the number of books I’ve thumbed through over the years, and no longer ‘raise an eyebrow’ or say “I don’t believe it”, I do wonder how many people this comes as something of a surprise to whenever it is raised. This collection of pics recalls the day. Today, marks the 100 year anniversary of the event which has become known as the ‘Battle of George Square’, ‘Bloody Friday’ and ‘Black Friday’. On January 31, 1919, tanks and soldiers rolled through Glasgow’s streets as authorities attempted to quell city workers’ demands for a shorter working week and improved working conditions. There is no commemoration of the event, and calls are now being made to have a memorial placed in George Square. I do like the lions on the Cenotaph in George Square, and collected some more pics of the pair while the square was being decorated for Christmas. Always looking down on us, always judging. But, at least there’s no chance of catbutt. Parked like that (they’re both more or less the same), I might get ‘Back of the head of disdain’, but a closer look suggests those rear ends aren’t going to make an appearance any time soon. Since I was in George Square shortly before Hogmanay, it seemed like a good idea to catch a pic or two. The first thing I noticed was some of the keen folk who wanted to make an early getaway. Fork lift and white vans ready to go! Back at the mulled wine stall, it looks as if the trade in ‘Mulled Buckie’ must have gone down well. Even the bottles couldn’t stand up straight! The next one is interesting (to me at least) as it shows the column in the middle of the square (with Sir Walter Scott, or his statue at least, at the top) has NO strobes illuminated. These were operating before, and it seems they can be a bit of a pig to keep working if they get wet. Moisture and high voltage generally don’t play well together, and they have had a reputation for committing suicide in the past. But I think the problem here is somebody just forgot to set them, or the fuse blew, since they’re ALL off. Since I’d given up wandering into Glasgow before this happened, I didn’t know (until I checked) that the George Square celebrations had been scrapped by the council back in 2011, following years of complaints and weather-related cancellations. See? THAT’S what happens if you just whine about something that organisers have no control over – they just say “Fine”, and return the favour. I’m being quite serious about this. I got the date from a news story about the cancellation, and it’s probably a fairly safe bet to make that the same people who added a load of insulting comments regarding the members of Glasgow City Council (for ending the organised celebration) were exactly the same people who piled complaints into the council when the weather led to year after year of cancellation just before the big night. 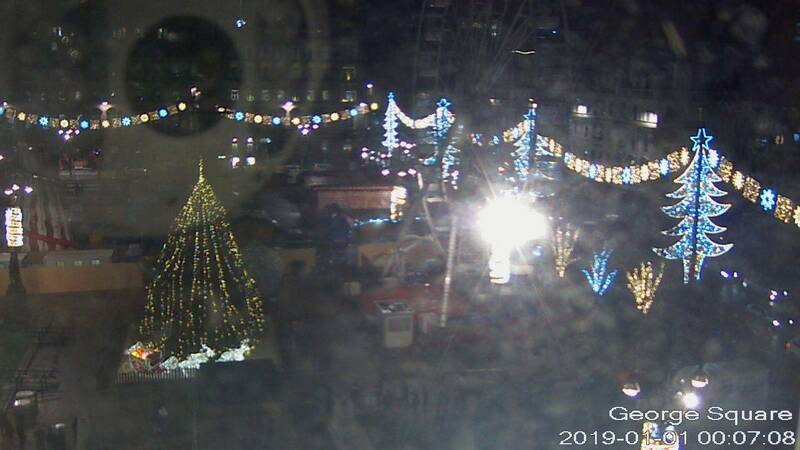 I looked in on the George Square web cam, to see if any of those same whining and insulting individuals had the initiative just to go to the square (where people did just turn up to greet the New Year), but no surprises there, and the place was largely deserted. It was hard to be sure, since some moron had left a floodlight pointing right into the web cam, and the glare was hiding most of the view. This was the scene (somewhere behind all that glare) at seven minutes past midnight on Hogmanay. I have to be honest… I’ve seen it busier. Watch that viewpoint, and PAY ATTENTION when taking pics! That included an illuminated globe that had featured in its own area last year, lightly fenced off to let people queue up to use as a setting for their pics. This year, it was just dropped onto one of the paths in the square. From that path, it just looked like the globe was there on its own – it wasn’t. There was another, only revealed if you were looking from the side. So here’s the whole picture of this huge pair of ba Christmas decorations. Hard to miss, but in the original pics, I did (check the originals in the post linked above). I also mentioned the poor reindeer I spotted (with a sore head) while taking those earlier pics. Thankfully, somebody noticed, called the electric vet, and it’s all better now. I’d also tried grabbing a daytime shot of the Square, as that’s easier to gauge how much can be caught in a wide shot – you can see the edges in daylight, but not in the dark! That eventually paid off, as I tried standing around the same spot at night, without also having to try to find it too. Turns out it’s hard to get that wide night shot. Traffic gets in the way, both wheeled and on foot, as you have to stand as far back as possible. That could be dealt with (just using patience), but there a bigger problem thanks to all the poles and junk that intrudes into the view. Guess I’ll just have to try standing in front of all that stuff, and take a set of pics to stitch together – nothing’s simple. After yesterday’s post on this subject, I was in Glasgow city centre again and passed through George Square during the evening. The Christmas market is still there, which I mention only because I deliberately avoided St Enoch Square earlier as it has a similar feature, or HAD, since I glanced down there from Buchanan Street only to see it had gone completely, so I needn’t have detoured. George Square was pretty quiet, but still relatively busy with folk having a last look. Last week, this would have been a solid mass of people. However, the interesting thing was the lack of cold. While many people were wrapped up as if it was freezing (and I ended up overheating when inside buildings yesterday – I really did have to step outside to cool down at one point, and I was far from ‘wrapped up’), and I honestly don’t know how they could stand being wrapped up in thermal jackets, hats, hoods, scarves, and gloves, others were wandering around in t-shirts. Here’s one example I caught at the side of a pic of the Christmas tree. Is this really Glasgow, Scotland, on 30 December? I checked my own temperature records when I got home. That said it had been over 12°C at my house then, and had started falling (but only to 11°C). Bear in mind I live in a ‘cold corner’, and a city centre can easily be 2-3°C warmer than the surrounding area. It certainly felt like that. Another of those shots you shouldn’t be seeing from me, this time a daylight shot of George Square’s Christmas lights. Fortunately, there’s not much Sunlight at this time of years, so I might smoke a little, but at least I won’t burst into flames. I went there after learning how smart it was to scope out a night shot during daylight, having tried it with the shot trying to get the whole of GoMA and its surrounding lights. It was quite an education, finding out just how far I had to beck down St Vincent Street in order to get the whole scene in a single wide angle shot. Pity I can only do this with the compact, which has a wider wide than the widest wide of the superzoom I have for the dSLR. Well, at least the higher quality catch it provides can be stitched, with little evidence of the join. STILL missed a bit on the left (partly deliberate, as the building was beginning to encroach, but more than I meant to), I have to try harder to remember the compact show and exact view – dSLRs generally show a little less, so you don’t miss edges. I went back later, to play with some more shots in the dark – which is not really dark with all those lights! I arrived at the big wheel, and was irritated to find that barriers etc meant I could not get far enough back (when close) to get any more than 70% in frame, even on the widest setting, in either portrait or landscape views. So, I had to give up and try the stitching mentioned above, but at least needed only two shots to get this combined view. Can you see the join? Fortunately, the exposure was the same for each pic, sometimes it can vary wildly. I was lucky the wheel stayed still too. I can’t control the distortion in these (much), but really wide lenses do something similar, and there’s not usually much complaint. I stepped back, to take some more normal, single, wide angle views of this, showing more of the lights, this time the illuminated globe that was on one of the lawns last year, and fenced off so people could take pics inside. They didn’t seem to bother doing that this year. Then there’s the Squares Christmas tree, which seems to be really FAT this year. I took a few of these, all slightly different, but mainly to see what would be caught from the ever-changing animated lighting of the big wheel. From past experience, I’ve learnt there’s little or no point in waiting for a specific effect (unless you really really HAVE to), and you might as well just take a lot of shots to catch whatever is happening with the lights. I should maybe add that these pics were taken before… it got cold and wet! Note the lighting on the tree. In recent years it has been simply draped from the top, in lines. In days gone by, it was wrapped or wound around the tree. Both fairly easy to put on – but I’m told that when the light strings were wrapped around the tree, by the end of the season they were a pig to remove, having been worked into the branches by the wind. Maybe they should make up special vertical looms. The straight drape means there’s a lot of lights together at the top, but they’re sparse by the time they get to the wider bottom. Two banks of LEDs would be good. One up top, as at present, then another with double density strings for the lower ‘half’. I’m also a little surprised the tree lights are steady, and not animated in some way, which is really easy with LEDs. I’m really surprised at what the compact is now delivering with the revised settings I made at the start of the season, but don’t ask me what they are, I’ve no idea what I changed. Actually, it has so many damned settings I have almost no idea what I’m doing with it. Half the phone book (manual) is dedicated to 4k operation, which I’ve never even looked at! Notable things I’ve learned is that I was right about the smallish sensor it uses. The pics are surprisingly good, but there is the ‘Falling off a cliff’ aspect, where the image quality just disappears below a certain light level, where the dSLR would still be returning decent views. The other really odd thing is that nearly all the shots are useable ‘Out of the box’, and don’t need processing to raise shadows, or lower highlights. I’ve hardly touched any (none of the above), and those I do need to fix were genuine low light views. What I’m finding this year is that I’m shooting a lot of wide views, nearly always having to tip the camera back, away from vertical, and have to do a lot of perspective correction. I think I’m lucky I found that tool last year, and got some practice in, or all the above would be very distorted and weird looking. Since a break in the wet weather let me take a quick look at George Square now that the setting up is finally done, the reindeer were an obvious target, as they’re kind of awkward to picture, being made up of white LEDs – they just morph into a single mass if you don’t choose your angle well. But the problem was different this time. One was clearly suffering from a hangover, and its head was flashing off and on (more ‘off’ than ‘on’). I had a few tries at catching the whole thing lit, but gave up as the time ‘on’ was so short. I almost caught it once. I know it looks ‘off’, but of you compare it to this fully ‘off’ head, then you can see I did almost manage to catch it. But, I had better things to do, so gave up. It was still relatively quiet, although the Christmas Market had already gone from reasonably quiet, to absolutely mobbed shortly after 6 pm. I’d walked in to it just before 6, and had been enjoying a quiet wander, and didn’t notice it had filled up like a sardine tin once the shops closed (at 6), and the crowd had just migrated. It took me nearly 10 minutes to shuffle out through the mob. They weren’t bothered with anything else, so I took the chance of a quick pic of the Nativity scene. I think I’ve been luckier than in past years here. It’s lit (I’m sure there have been problems with its lighting in the past) so you can see what’s inside the glass box – added after somebody thought it would be clever to steal the baby one year! Even the reflections from the lights in the Square aren’t obscuring the interior, and I didn’t have to avoid the throngs of doting parents wanting pics of their sprogs standing in front of the crib. Getting there early seems to have advantages. It’s odd, with the slightly different camera setting I’m playing with this year, as even the compact (all I can carry at the moment, most of the time) is producing half decent captures that I don’t have to process (other than for framing) to alter the exposure. Previously, I’ve processed the exposure for almost every night or low-light pic, and it’s odd to find that even trying this only for curiosity just produces a result I don’t like, and I go with the pic as taken. After noticing reports of Mac and Cheese with Haggis and Buckfast sauce being on offer in George Square’s Christmas Market, I got lucky, the weather dried up, and I got in to see it for myself. I’m clearly out of touch with reality, or something, as I wouldn’t even think of coughing up £7 for takeaway ‘mac & cheese’ (regardless of Haggis and Buckfast sauce). Aldi and Lidl sell a WHOLE TIN of mac & cheese for 40 p (and I wouldn’t be worrying about needing a toilet soon after eating it). The stall has the evidence on display. I don’t know about the Buckfast (still hasn’t passed these lips – in either direction), but I can thoroughly recommend the tinned haggis. I’m sure some puritans wouldn’t even consider the stuff, and taste it let alone eat it, but I promise you, it’s better than many so-called ‘real’ haggis sold in pretend casings for you to boil or steam yourself. I’ve had some of those that were so bad I didn’t even get as far as tasting them, as I almost threw up from the smell of the hot contents when I cut into them. Tinned haggis, reliable AND tasty. Buckfast is not in hiding in George Square, and made another appearance at a Mulled Wine stall, in plain sight. I had to be in Glasgow yesterday, during daylight! I passed George Square, which is STILL being ‘assembled’, despite having had the Christmas Lights Switch On last weekend. So, I had to have an unusual, for me at least, daytime pic of the Christmassy stuff going on there. I didn’t know I’d be back a few hours later, so there’s more, and brighter. The lit thing on the left is an eatery in the Christmas Market, which is also being installed now. I think they’re doing to have to work hard AND fast – the market is due to open in only a couple of days, on Sunday 25th! Last year I thought it was one of the fairground rides, as the bottom was obscured and couldn’t be seen until the market opened, and I learned better! I’m still being surprised when the compact produces decent night pics. It really does ‘fall off a cliff’ as the light falls at higher ISO, and the images suddenly get mushy and ‘noisy’, but until that point they come out well, and I was even able to lift shadow detail from this one, without the noise becoming objectionable. A couple of oddities/observations as I wandered around last night. First was in the St Enoch Christmas Market, where there seemed to be an odd, selective, power failure. I thought one stall was just setting up as it was in darkness, but then noticed a lot of them were dark, with the stallholder just standing around. Not good for food stalls. I’m guessing that the power distribution was allocated randomly, or perhaps just as stalls were completed as the market was being set up. It all looked a little odd, as the stalls were dark, but the attached decorations were lit, as seen below. It’s also a little odd seeing it all so quiet – but closer to Christmas, if it’s like last year, this scene will make a sardine tin look half empty as the punter pack into the space. Then there was Hanover Street, which was closed at the George Square end while the square was being set up for the lights and fair. This was the shot I wanted. Could I get it, quickly and easily? Despite signs and cones at the other end of the street informing drivers that it was closed at George Square, a steady stream of morons kept arriving at this barrier (which at least demonstrated their skill at performing 3-point turns – probably because they get plenty of practice!). Serious thought – instead of picking on the elderly, people with glasses, or other easily identified and targeted groups to ban from driving for no good reason, why not use the CCTV cameras and ANPRS to identify ACTUAL PROVEN motoring morons such as the one seen below, and serve them automatic bans, or retests, before they are allowed back on the road? Drivers like this, wandering around without a clue about what is going on around them, not paying attention, are a greater danger than any group which is simply picked out because of some visible feature. I seem to recall that method was used to fill… concentration camps! So, to follow up on the George Square lights post, I did a quick divert and collected the George Square Christmas lights, trying to stand on the same spot. As can be seen, after my observation that the square was a little bare compared to the same time last year, the explanation is now obvious – the space has been left for the shows, that’s fairground if you’re not local. Unlike previous years, the square has been kept closed by perimeter fencing after the big Switch on, while the fair is being built. And this was my try for the second pic. That seems to be one FAT tree we’ve been gifted from Norway this year. The multiple Christmas trees along the edges of the square look good when they’re aligned. Did I mention the barriers? There are barriers. I couldn’t resist one more ‘chance’ shot as I was walking away. This is the area where the Christmas Fair will be erected next week, but at the moment is just being used as a muster area since it can’t be used for anything else. I mentioned trying new settings for my low light hand-held pics, mainly moving down from the high ISO numbers I let the camera wander up to. It seems to work quite well where things are bright, but the shutter speeds suddenly disappear down a hole when it gets darker, and shots become a lot harder to catch. And ‘grab’ shots in failing light are very hit-and-miss, since it’s not possible to hold the camera still long enough for most of them. I tried to catch a couple of interesting cars – not even close! But the old setting would have delivered a rough, but at least useable, image. Maybe I should just get a smartphone.